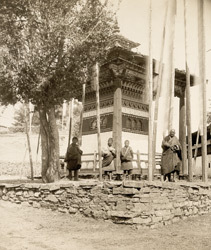 Photograph of a chorten (stupa) at the Monastery at Gorina in Bhutan taken by John Claude White in 1905. This is one of a set of photographs documenting White's mission to Bhutan to invest Ugyen Wangchuk, the Penlop (Governor) of Tongsa (Trongsa), with the order of Knight Commander of the Indian Empire. This photograph also appears in The National Geographic Magazine (Apr 1914), with the following caption: 'A fine example of chorten, or shrine, at Gorina Monastery, surrounded by prayer flags. In front a venerable lama is telling his beads. The carving and decoration on this was good and the images well modeled'. Gorina is situated west of Paro. Chorten is the name used in Bhutan for the stupa or Buddhist monument which often contains relics. Bhutan has three different styles of chortens, the Nepali, the Tibetan and the Bhutanese. While the classic stupa shape derives from ancient India and has a dome topped by a spire over a square or rectangular base, the Bhutanese-style stupa as seen in the image consists of a square pillar-like building with a shingled roof and abbreviated pinnacle.